36 holes wasn’t enough to find the New Zealand Women’s Amateur Champion, with Auckland’s Vivian Lu making a clutch birdie on the first extra hole to claim the 2018 title. Lu made a vital four birdies in five holes to close out the match in what was a seesaw affair against lead qualifier and hot favourite, Kum Kang Park who had a superb week at Wairakei Golf & Sanctuary. At the age of only 14-years-old, Lu got off to a great start as she built a 5up lead through 14 holes against Park, but the Korean showed why she was the number one seed and clawed her way back in the match. Park made a crucial 30ft par save on 15 to avoid going six down before winning the last three holes, all with birdies, to close the gap to only two down at lunchtime. Park then continued her charge back into contention, eventually squaring up the match with six to play. As they traded birdies, it all came down to the last hole where Park was in a spot of bother before her phenomenal chip shot rattled the pin and was enough to take the match even further, but she could not repeat the heroics with Lu having the final say. On the 37th hole after an exhausting five days play Lu found the strength to nail a curling 18ft birdie putt to claim the national title in style. 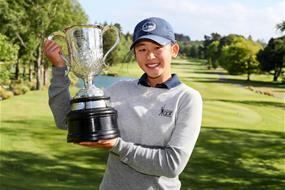 “It feels really good to win the biggest amateur event in New Zealand, and this title is really amazing,” beamed Lu. The Auckland representative has put together a superb year on the New Zealand Golf circuit after winning the Akarana Open on the Jennian Homes Charles Tour and now adds her name to the history books alongside some great players including two-time champion, Lydia Ko. The majority of these players will now turn their attention to the Toro Interprovincials where it will be all match play as we search for the best district in the country in late November/December.